“Like many adventures in my life, the trip to Basunti began with beer and curry. This was of course courtesy of the chef at Mrs. Bhandari’sGuesthouse, before everyone turned in for cosy night’s sleep. 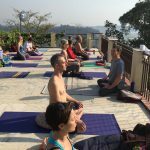 The next day we travel through the picturesque countryside of North West India, eventually crossing the now famous Pong Dam and arriving at the Basunti Yoga Retreat, where upon we received a warm welcome from owners Dave and Izzy. So began our ten-day retreat with The Devon School Yoga. I’ll be first to admit that the prospect seemed daunting: 7am-9am meditation and sun salutations on the rooftop, 10:30am-12:30am asana in the shala, back in the shala at 4:30pm for satsang and finally ending up back on the roof at 6pm for pranayama. I was certainly one of least experience in the group and I was quite unsure as to whether I would be able to keep up the pace. I need not have worried though, as it soon became clear that I was among friends who were more than willing to support me. In my opinion this support network is really the key to retreat’s continued success. On this occasion we had an age rage of 17-61 with people of all abilities and backgrounds practicing, eating and living as one community. For example, there were times when our guru Duncan would demonstrate a posture and we’d just look at each other in disbelief. However after some guidance and a bit of teamwork we were all congratulating one another on the fact we could hold the posture too. No one ever felt pressured, simply encouraged. 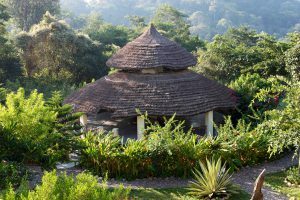 Duncan Hulin and his yogis will be returning to Basunti, India, in spring 2019 (26th March-11th April, 2019). 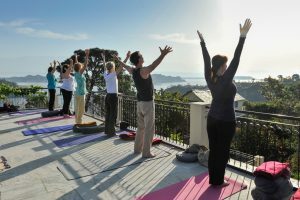 For further information, go to www.devonyoga.com, email info@devonyoga.com, or call 01392 420 573.